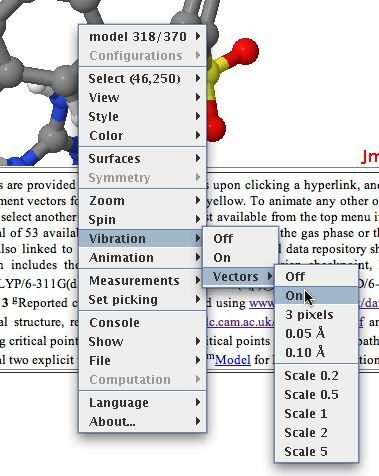 Firstly, load a molecule into the Jmol window by clicking on e.g. the hyperlink shown below. 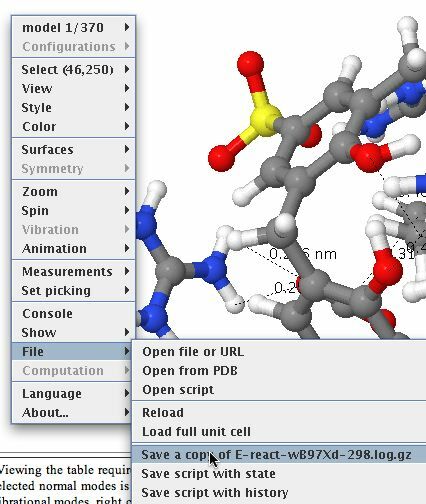 The display shown below will appear, in this case a set of coordinates used to present a 3D model of a molecule, which can be rotated, zoomed, etc. It also has been labelled with various selected bond lengths etc. 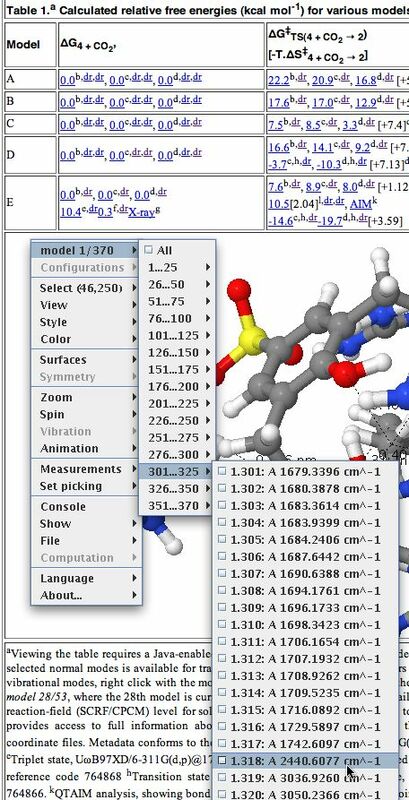 To extract data, right-click anywhere in the molecule area. Navigate through the menus which appear as shown below. In this case, the data is present in the form of a Gaussian log file. This can contain the history of the particular calculation performed (e.g. a geometry optimisation) or as in this case, all 3N-6 calculated normal vibrational modes. The one of interest here is number 318, being an O=C=O stretching mode. 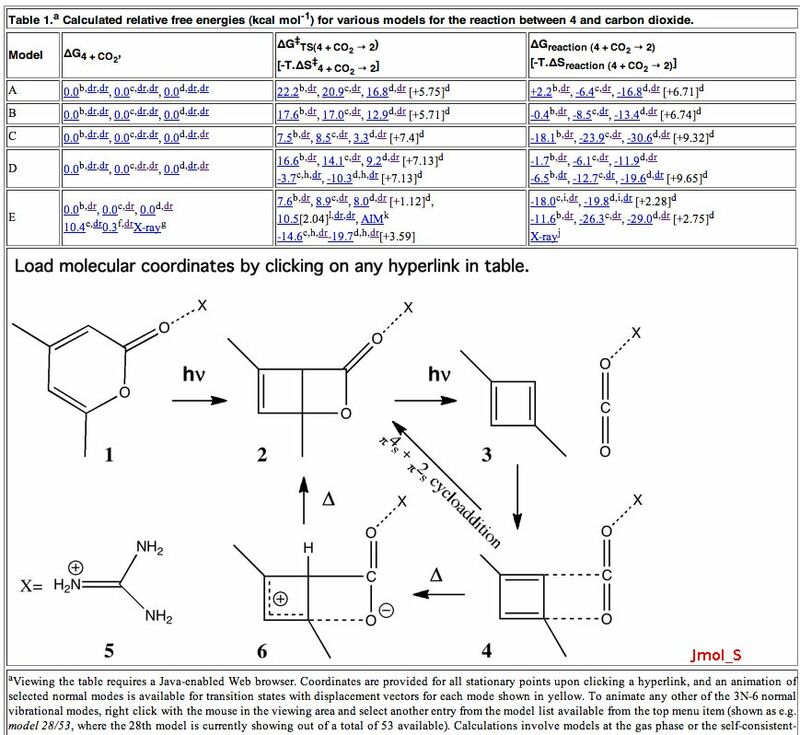 An Interactive table in a chemistry journal. Jmol has a scintillating display of other options, and more are being added all the time, so the above display is by no means the limit of what one can do. Now to the most important bit. Invoke the menu as shown below, whereupon a copy of the relevant file (gzipped in this case to reduce its size) will be downloaded to your local system. You will now need to use a program on your own computer capable of reading and processing such a file (after unzipping). There may be a bewildering variety of programs and toolkits which may perform the operation you wish on such a file. Some are commercial, some are open source. To help people get going, I link to one of the latter type here, You might also want to visit the Quixote project for ideas. This produces a page such as below, which contains more files. In this example, several molecular identifiers are present (InChI and InChI key) to help identify the uniqueness of the system, the molecular coordinates are available as a .cml file which itself can be processed by a variety of software tools, the original file used to run the calculation can be inspected (if you want to eg repeat it) as input.gjf, the logfile we have seen above, and a checkpoint file, which is most useful when using either the Gaussian program system or a visualiser (Gaussview, ChemBio3D etc, both commercial programs). A SMILES string is also offered, and sometimes (not in this example) a so-called wavefunction file which can be used by some programs to analyse the wavefunction, and perform e.g. QTAIM, ELF, NCI analyses. It is now up to the user to identify suitable processing programs on their computer which fit their purpose. There is one other file present which I have not yet explained, the mets.xml manifest. 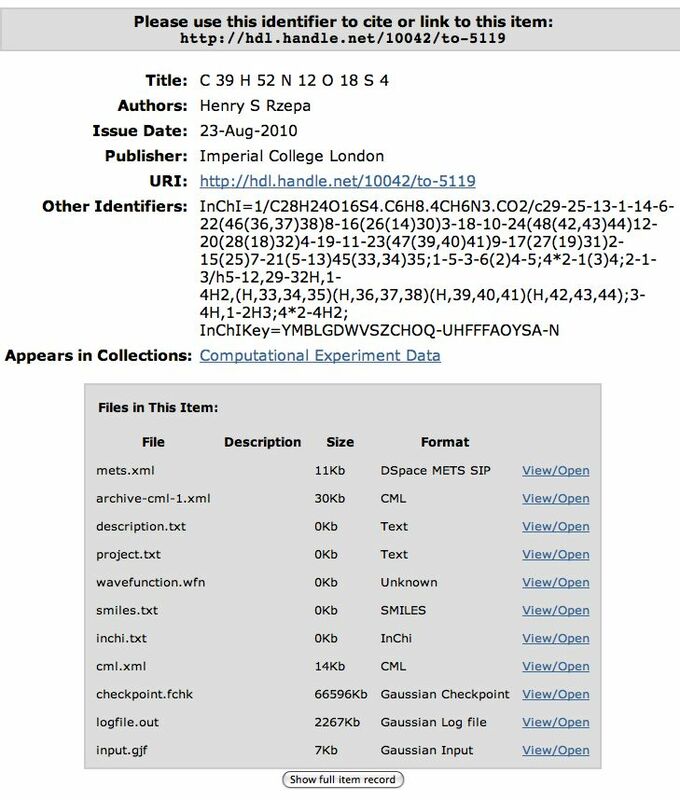 This is a metadata file, containing (along with much else) an RDF declaration of (some) of the properties of the molecule. In theory at least, this file could be automatically harvested for the RDF, which could be injected into a triple store, and queried semantically using eg SPARQL. That is part of the semantic web. I hope some of the screenshots here make the process of extracting data from an interactive table article a little more obvious. I must declare that this way of doing it is just one of the ways being explored and also (much to my regret) is not yet particularly common. But hopefully you might capture a little of what some of us believe to be the future of scientific journals. This entry was posted on Wednesday, December 22nd, 2010 at 12:30 pm and is filed under Chemical IT, Interesting chemistry. You can follow any responses to this entry through the RSS 2.0 feed. You can leave a response, or trackback from your own site. 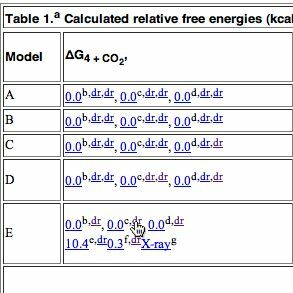 The problem is that smart scientists require this to be automatically done by Excel. Yes, the do everything in Excel 🙂 I guess the only way to get Joe Scientist blogging, is to develop an Excel plugin. recently. No-one had ever requested it! I have the following story to tell from ~1996. We had switched on rotatable (in those days, Chime) models in Chemical Communications. The authors of high profile articles had been asked by the RSC to provide molecular coordinates. When the article went live, one of these authors wrote into the Editor-in-Chief, complaining bitterly that the graphics images in his article were low resolution. Surely the journal could do better? 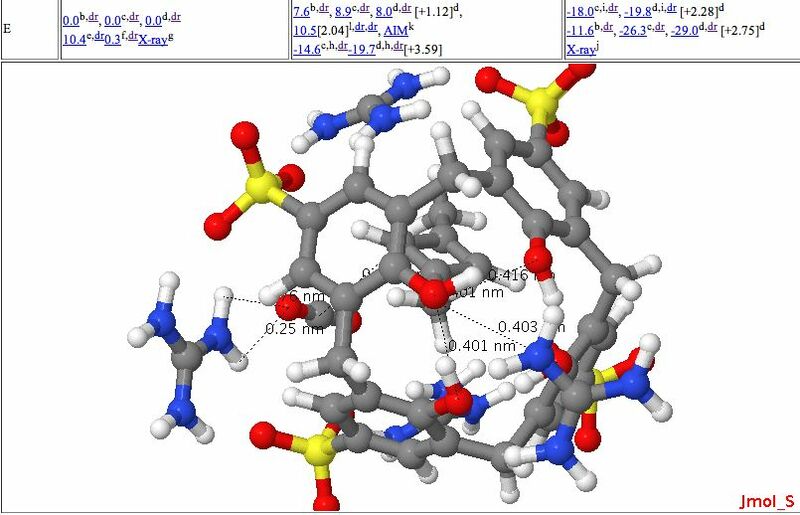 He had to be informed that in fact the image he was complaining at, if not in high resolution, was at least rotatable and manipulable (the molecule itself was a complex inter-twined catanane). The author had simply not cottoned on to the purpose of providing coordinates, or that an image could be something other than static. (re)Use of data from chemical journals. is licensed by Henry Rzepa under a Creative Commons Attribution-Noncommercial-Share Alike 3.0 United States License.